Quirk. Strangeness. Charm. And all in Search of OU 2.0... Exploring the potential of Web 2.0 techniques and applications in higher and distance education, informal and lifelong learning. 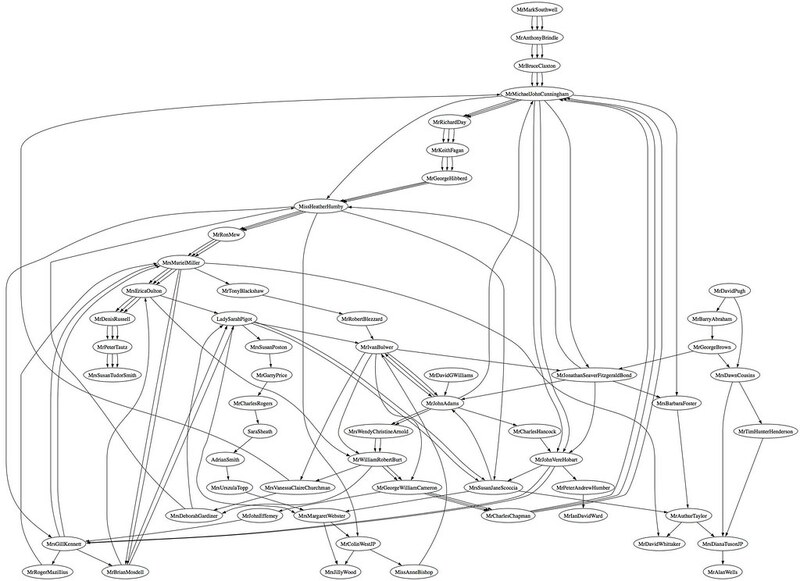 Anyway, had everything been working, I'd have posted about a screenscraper that trashes through results pages from ORO repositories, and generates a .dot graph definition file that can be visualisaed using Graphviz. Like this excerpt of a view of authors of papers on LB1603 Secondary Education: High schools from the University of Southampton open repository. So for example, here's a graph showing all the people who sit on the same committees in the Isle of Wight Council (as of June 2008); multiple links between two people shows they sit on several different committees together. The direction info in the links is rather more arbitrary, except in two particular cases... if you are only ever the chair of a committee, there will only be links going away from you... If there are only ever incoming links to you, you are not the chair of any committee. 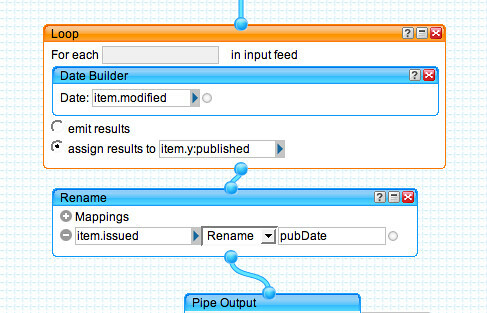 - Graphviz filter for Drupal; I had asked Liam if he could get one of these running somewhere, so I could plug in the eprints repository scraper and we'd have a neat IWMW innovation competition entry, but as my scripts all appear to be broken, and I donlt have time to fix them, I guess that's for another day (or not...).. The University of Aberdeen (and many other universities) publish an RSS feed of their media releases. But how effective are these releases? That is, do the releases actually manage to generate any news coverage? One of the easiest ways of doing a news search around an organisation is to simply do a search on Google news. Conveniently, RSS feeds for persistent (alerting) Google News searches are available: Atom feed for Google news search for university-of-aberdeen OR aberdeen-university location:uk over the last month. That's possibly useful in a different way, though, because it will capture all recent mentions of the university in the UK press. So here's a recipe that attempts to find news stories about the university that are also on the topics mentioned in the press releases. For convenience, I've specified the recipe as a working prototype in the form Yahoo Pipe. Fetch the press release feed and run the description of each one through the Yahoo content analysis/term extraction tool. 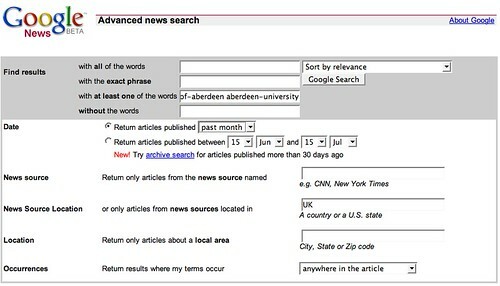 Use these terms as the basis of a search query, supplemented by additional search terms for ("University of Aberdeen" OR "Aberdeen University"). Finally, we use the news story date for the timestamp of each item. UPDATE: In the meantime, it's easy enough to merge a feed of the original media releases and the contextual/content extracted terms news search. 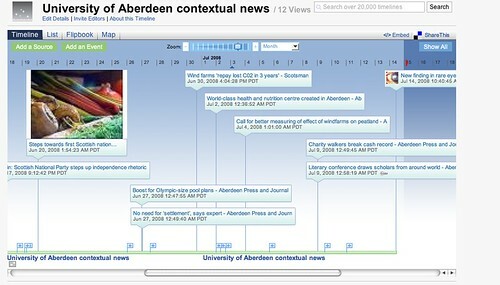 So to recap, the idea is to take a university media release news feed, automatically extract a set of keywords related to each media release, and then use those keywords as the basis for a set of queries on Google news for UK based news items related to those topics that also mention the university in question. 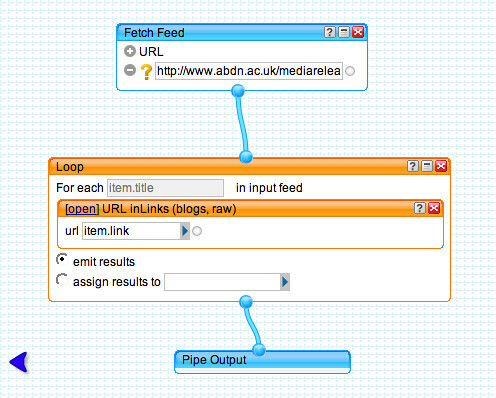 The results are then output from the pipe as an RSS feed, or otherwise. Each item is timestamped with the date of the news article, so it can be displayed on a timeline, or otherwise, as required. This pipe loops through each item in the media release feed, and searches for blog posts that have linked to the original story (that is, that have linked to the URL for the particular media release). The "URL inLinks (blogs, raw)" module is one I had built earlier, that uses a Google blogsearch to find posts that mention a particular link. It would probably be more effective to look through each media release to see whatstory related websites (if any) it mentions/links to, and then use these as the basis for the blogged link search (for example, I may not be likely to link to the press release, but I may point to the research group web page it describes). 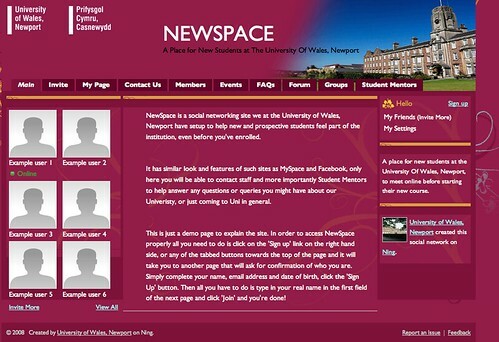 Reading the feed from Michael Webb's Blog yesterday, I was.... stunned is probably the best word, to read his post "Newspace - a social networking site for new students" which describes "a social networking site for new students at the University, http://newstudents.newport.ac.uk." And why was I shocked? 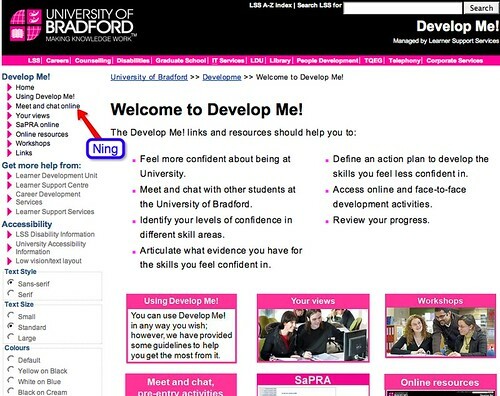 "It's based on Ning..." (a site we've also used as an online social network complement to our two recent SocialLearn workshops). 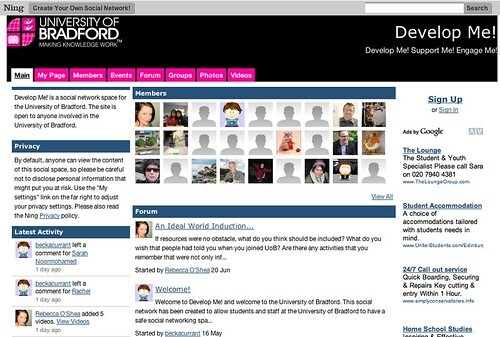 So with some institutions feeling adventurous and taking the plunge into the world of social web apps, whilst maintaining some element of control, how will SocialLearn fit into all this? Like this maybe? That is, maybe SocialLearn could become a trusted gateway to the world of social networks that institutions are more likely to trust than sites like Ning? By providing an open API and clear security model, it may also provide a platform within which insitutions can develop their own social applications or expose their own data to their own students in a social context? In developing a trusted pltform though, a lot would ride on the structure of the governance model, which is still unclear (at the moment, it's being run within the OU, using external developers, as an OU strategic development project). Something I feel we need to explore is find a way of helping information "flow" around the university more, routing it to the right people as needed. A few of us do this anyway in an informal way anyway, either as a broadcast (eg public blog) or point-to-point communication "FYI emails"; thing's like the LTS media monthly newsletter also communicate news items to people who are likely to be interested in such things. As far as soliciting the opinions of OU members about particular technologies, then we need: a) a way of routing these 'call for comments' to people who can comment quickly; b) getting comments back to the people who need them in an appropriate form. Being lazy, I'd like to be able to do several things at once with any comments I make - eg: a) get the commentary back to who wants it; b) get a blog post out of it ;-) It'd also be nice to think that there was some way of actually seeing new ideas built on and rolled out across the university. Then yesterday, John Tropea/Library Clips posted some thoughts on "There’s more than just supply-side KM", (a response to this article on Ideation and the Supply Side of Knowledge): "The article is about how much time and energy we devote to: Capturing and storing vs Knowledge flow...[I]n a learning organisation you are aware of solutions as they happen, even if you have no use for them at the time. You can connect to people involved in the solutions, and you are connected to people in general. The act of participating gives more chance of solutions coming to you more easily… you have more of a chance of shared context and the peripheral information around a solution." [T]hose who believe that "management" is about control and predictability often view KM as a way to bring about predictability, by documenting all best practices and lessons learnt and making them available to everyone. Here, the supply side becomes focused on explicit knowledge, on identifying and generating quality content, and generally focused on learning from the past. The hidden assumption is that once the right answers are all available in the repository, everyone will come seeking it. Demand, it's assumed, is automatically created. This then produces a robust internal knowledge (content) market, complete with consumers and producers of knowledge (content). Now where I thought this argument would go was along the lines of: even we do manage to curate information about new technologies effectively, that information is not necessarily going to be worked effectively if that information doesn't continue to circulate - or "flow" - around the organisation, as part of an ongoing conversation within the organisation, in particular the conversation between those people who can benefit from the information, work it further, or work it into conversations with other people who might benefit from it. But even if one were to subscribe to this viewpoint, it has at least one obvious shortcoming. By equating KM with content management, and by equating the purpose of KM with predictability and control, we may inadvertently de-emphasize new knowledge creation. ...[N]ew knowledge creation is about the future. It's about possibilities and alternatives. It's about doing things differently and unleashing creative energies. It's about innovating. Companies that are serious about innovation have to create an organizational ecosystem that allows for creativity to be sourced, transformed into inventions and then into innovations. This forwardlooking view gives KM a new meaning and purpose. Companies that are able to foster new knowledge creation alongside the more traditional view of KM, are able to strike a balance between effectiveness and efficiency and between innovation and productivity. This is a necessary condition for longevity in a global knowledge economy. Ideation is the first step in the whole process of innovation. A good way to judge whether a company is serious about innovation is to see what happens to ideas in that company Some indicative questions are: Who is responsible for generating ideas? Once generated, how are ideas transformed to inventions? If these questions have been explicitly considered in the organization, then chances are that the first step towards a generative view of KM strategy has been taken. This shows that the company values knowledge creation. If these questions are implicit, or we have to search for the answers, then chances are that a strong enough focus doesn't exist yet in the organization. If the R&D department is viewed as the place where ideation happens and inventions take place, then we are again [li]miting the potential of tapping into the collective creative energies of the organization. R&D personnel are not the only ones with ideas and creative minds, and open processes should exist to tap into the collective capabilities of employees. As well as creative minds that generate ideas, we also need minds that know how to transform wild ideas into feasible implementation projects and we need minds that are able to understand market potential and how to tap into it. In short, we need to transform ideas to inventions and then inventions to innovations, tapping into the collective insights and capabilities of complementary minds. Base skills, competences and strengths may differ across employees, and by themselves have limited use, but the power of tapping into their collaborative capability is tremendous. This line of thinking resonates strongly with me. After almost 10 years here, I still don't understand how the OU manages to take internally produced "inventions" and work them up to a state where they can be delivered as institutional innovations... Although maybe that's about to change? OU Job Ad: Change Manager, Developments Manager, Two Senior Project Managers, Learning Innovation Office (LIO), Strategy Unit. Based in Milton Keynes. Fascinated by the use of new technologies to enhance the learning experience in higher education? A Learning Innovation Office is being set up within the Open University's Strategy Unit to coordinate the development of elearning and innovative teaching and learning. Building on the University's new virtual learning environment (VLE), the Office will commission and oversee further development work, coordinate elearning strategy and policy, and monitor and disseminate learning innovations at the OU and elsewhere. The Director of Learning Innovation has been appointed and a number of staff are being recruited to work with him. Excellent organisational, interpersonal and communication skills, flexibility and initiative will be needed by all of the role holders to liaise with a wide range of academic, technical and administrative colleagues. You should have considerable experience of elearning development and implementation. You will work under the leadership of the Director of Learning Innovation to plan and initiate a range of strategic change initiatives, aimed at promoting elearning and embedding the OU's new VLE across the University. You will need exceptional communication, presentation and project management skills and will have significant experience of coordinating change initiatives in higher education. You will be supported by two Senior Project Managers. You will work under the leadership of the Director of Learning Innovation to manage the operational activities of the Learning Innovation Office, and to plan and oversee a number of projects to develop additional functionality for the OU's new VLE. These projects will be managed by two Senior Project Managers who will report to you. You will need exceptional project management skills to provide effective management of these initiatives, significant experience in administration related to systems development, and will liaise with colleagues in other units who will be providing the technical and operational management of the VLE. The Senior Project Managers will work under the direction of the Developments Manager and Change Manager, Learning Innovation Office, to plan and manage a number of activities aimed at promoting elearning and usage of the VLE, and to manage projects to develop additional functionality. You will report to the Developments Manager in the Learning Innovation office and you will need excellent project management and communication skills and significant experience in administration or systems development to provide effective management of these initiatives. Europe's largest and most innovative university is seeking an outstanding individual for the new post of Director of Multi-Platform Broadcasting, which has been created following a major review of our broadcasting strategy. You will have extensive experience at a senior level in the broadcasting and/or internet sectors and will have the strategic vision, management capability and technical understanding to enable the University to realise the potential of all broadcast media to support its global teaching and learning, research and public engagement missions. You will work closely with the University's Open Broadcasting Unit, with a wide range of areas of the University, and with the BBC and other key partners. You will be responsible to the Pro Vice Chancellor (Strategy, Planning and External Affairs) for the achievement of the University's ambitious broadcasting objectives. I'm not sure whether this post in marketing will report in any way to that post, though? In this new role has been created to focus on developing marketing plans covering BBC programming, Widening Participation & Openings and other marketing projects. You will work with marketing colleagues in the OU and BBC to scope and identify education and training opportunities for the Widening participation sector, opportunities to promote the BBC and marketing our Openings courses. You will also develop and manage fulfilment of a marketing plan to these markets and identify appropriate channels to market. We wish to appoint an outstanding individual to the Futures Office, to manage the implementation of the OU's strategy for Europe. You will liaise with key stakeholders across the OU and externally to evaluate and identify the optimum business model for the OU's operations in central Europe, shaping the OU's strategic priorities for international growth. Reporting to the Head of Customer Communications, as part of the sub unit management team, you will lead the planning, development and execution of marketing programs for the business to business segment; targeted to increase OU awareness and to generate enquiries from employers resulting in sponsored students, CPLD (Centre for Professional Learning and Development) revenues, etc. Open University Validation Services is responsible for providing Open University validation for external academic programmes; and vocational awards through the OU Awarding Body. More than 33,000 students are currently registered for validated and vocational awards in more than 50 partner organisations. The University is currently investing in a restructure of OUVS and an expansion of our team. As part of our expansion we are seeking a Senior Manager (Administration) to manage central support services including management of registrations, certification and aftercare services. Needless to say, I have nothing to do with appointments to any of those posts, at the dizzying heights such as they are (I'm way down the food chain, and on the academic side of the fence too...). That said, I'll probably heckle whoever does get in and try to grab a coffee with them every so often! 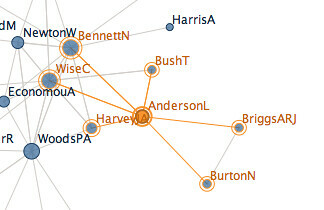 Having tinkered using Moowheel to visualise coauthors on references pulled from the OU's open repository (ORO) in Visualising CoAuthors in Open Repostory Online Papers, Part 1, to give a graphic which isn't really that useful or interesting (too cluttered), I thought I'd try out a couple of network visualisations using Many Eyes and Graphviz. 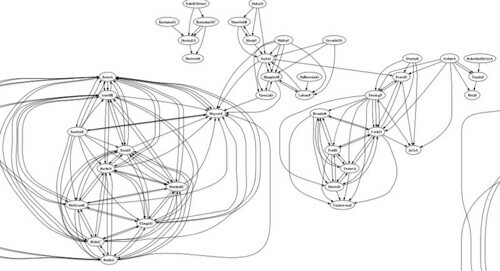 It's possible to construct graphs using both these tools by organising the data in pairs - so for each reference in a collection of references (for example, all the papers produced by a particular unit, or all the references returned from a title/abstract search on a particular query term), I pulled out every possible pairwise combination of authors. (So for exampple, a paper authored by A, B, C and D generates (A, B), (A, C), (A, D), (B, C), (B, D), (C, D) as all the possible pairwise coathor relations for that reference.) For convenience (i.e. as a result of laziness), I allowed duplicate pairs into the list (so if A and B had coauthored mutliple papers, their pairwise cauthor relation would appear many times in the data set. As it seems that Many Eyes now allows visualisations to be embedded, let's see what happens if I try to embed the above. At a high level, this visualisation allows us to pick out clusters of what we might refer to as different co-authoring teams within the unit. 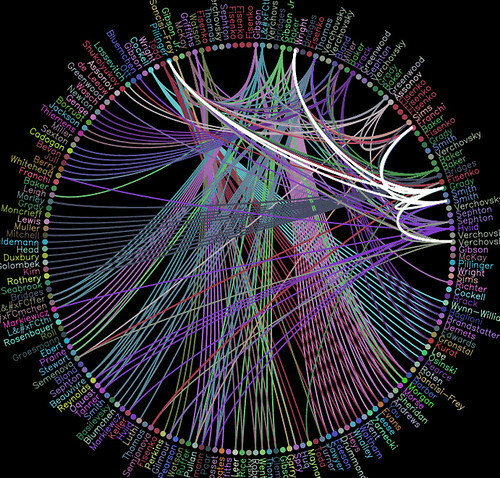 If we were visualising references returned from a search on a particular topic, the result might allow us to detect different groups working in a similar who don't author with each other, or different domains that use the same term but in completely different senses. 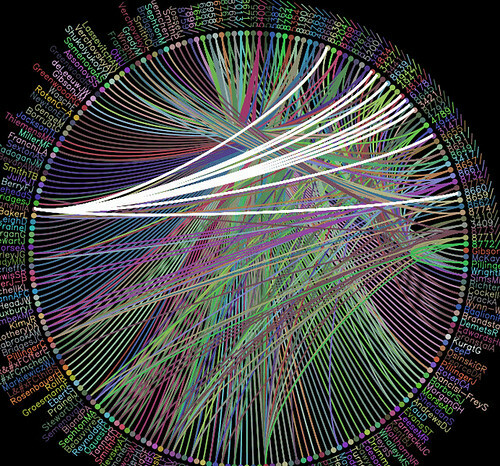 There are also a few things to notice in the detail about the Many Eyes network visualisation. Firstly, ambiguity in naming has a visual effect: WoodsPA and WoodsP are the same person I think, so their different representation creates an artificial degree of separation in the visualisation. 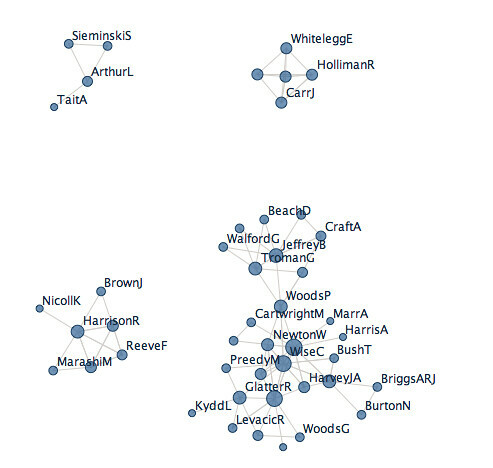 Secondly, the node size reflects the degree of (I think) each author node - that is, the number of coauthors are connected to. I'm not sure if it also represents the absolute number of times the name appeared in the uploaded data set? Which leads neatly to the third point: the repeated occurrence of the same coauthor pairs are not apparently visualised. If you're not familiar with it, Moowheel constructs a circular display of points that are connected to each other by some relation when provided with a set of data organised in an appropriate way. For example, in delicious Tags'n'users Wheel I used Moowheel to show the tags used by different users who had bookmarked a particular URL on delicious. Hovering over a username highlights the tags they used to bookmark the original link. In Moowheel v0.1 at least, the data must be supplied in a form similar to: (a, b, c), (c, a, d), (b, c, e), (d, a), (e). To construct the circle, each item (a, b, c, d, e) must be present as the first item in a set; each set describes the items that are connected to each other in some way.) 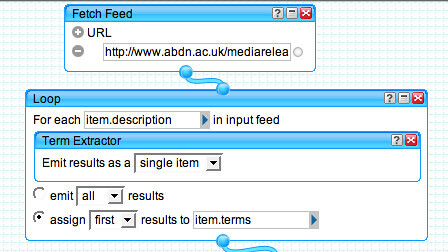 Links are highlighted to members of a set when the first item in the set is hovered over. - construct a list of unique authors and use this to create the unique items on the circle: (author1), (author2), (author3), ..., (authorN). - construct sets of the form: (author1, author2), (author1, author2), ..., (author3, author1, authorN) - where the first set are the authors of paper1, the second set are the authors of paper2, and so on. If you want to have a play with the Moowheel, you can find it here: ORO viz demo 1. - construct sets headed by unique authors, and the papers they had contributed to, and use this to create the unique items on the circle: (author1, paper1, paper2), (author2, paper1), (author3, paper2, paperN), ..., (authorN, paper2). - construct sets for each paper listing the authors who had contributed to that paper: (paper1, author1, author2), (paper2, author1, author3), ..., (paperN, author3). 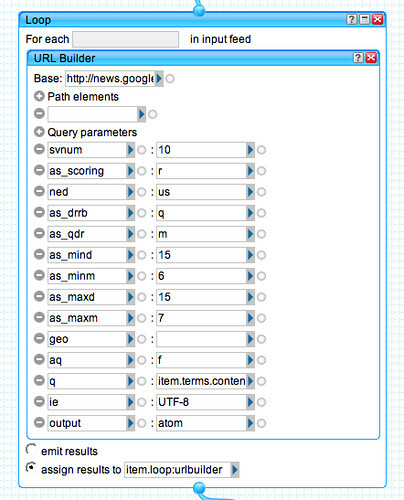 This time, if you hover over the name of an author, the links to the papers they contributed to will be highlighted. If you hover over a paper reference, the authors who contributed to it will be highlighted.